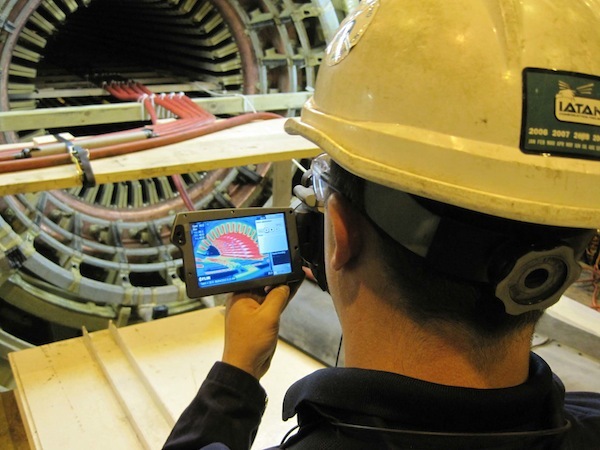 Technician performs an infrared core ring test. Infrared thermography gives you a measurement of heat in your electrical system. Thermography can reveal several problems like bad connections, overcurrent, bad insulation, or poor ventilation - all of which will lead to failure. One objection we find in the market place has been the advent of the "over-the-counter" cameras, which are being peddled to facility people, with little or no training.Â We have found situations where a facility makes this purchase and is then operated only once or twice by an untrained person, then left incomplete in terms of analysis of the scan and measurements. Whereas our service provides and action plan to correction these problems before failure, and is documented. We have skilled thermographers who have completed formal classes in thermography and routinely work with our skills in a variety of situations. We believe the value that our thermographer brings with experience and training out performs an "over-the-counter" purchase that our professional infrared camera is superior to in quality and performance. Our infrared camera can find loose connections, identify open fuses, find overheated breakers, and troubleshoot HVAC systems. An infrared scan is a non-contact way to see iif connections are loose, because loose connections will be hot. Open fuses don't carry current, so they won't be warm. A breaker can overheat for several reasons, and they all require attention. For example, it may have a corroded contact. Unless you can measure the heat, you aren't likely to know a problem exists until a failure occurs. With an infrared scan, we can quickly trace overheated contacts.